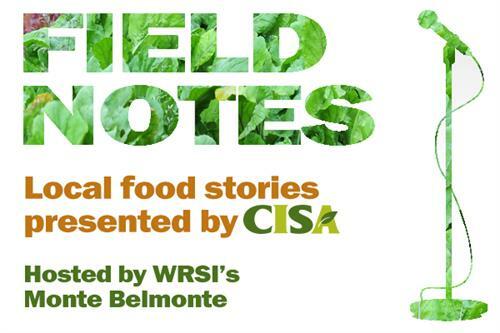 Farmers, chefs, and neighbors from throughout the Pioneer Valley will take to the stage to share their stories at Field Notes: An Afternoon of Storytelling. Join CISA (Community Involved in Sustaining Agriculture) as we celebrate the Local Heroes who make our thriving local food community tick! Take a glimpse into the lives of the people who grow and cook the local food we love as they tell true stories from their life experiences. Expect everything from the tragic to the hilarious as we journey through the fields and kitchens of the Pioneer Valley. Find out what it’s like to grow up on the family farm and see the view from behind the kitchen doors of your favorite restaurant. Join us and discover how local food has shaped the lives of the Pioneer Valley community in ways big and small. Our host for the afternoon will be Monte Belmonte from WRSI The River.